Seasonal hours-of-daylight can affect travel options in this region. In the spring, morning twilight will start at 06h00, and sundown will be around 19h30. In the late fall, after clocks change from Daylight Savings to Eastern Standard time, morning twilight will start at 07h00, and sundown will be around 17h00. Travel in the fall will necessarily be foreshortened. Do not travel A-ICW waters at night unless you are very, very familiar with the area. On the various ICWs, no matter the location, do not assume the magenta line correctly portrays the best route or the deepest water. The charted “magenta line” is at best only a guide to the general direction of the recommended route. It is a good guide, but it is not perfect and is not suitable for piloting a boat. As the waterway changes, markers are added, relocated and removed. Printed charts cannot and do not keep up with local changes to the actual waterway route. Even the most current version of a chart can be years out-of-date. It is therefore essential for helmsmen to maintain a careful watch. The wise captain will also monitor daily US Coast Guard “Marine Safety and Information Broadcasts” for up-to-date information on missing or off-station markers and other hazards, but the general “rule” is, markers in the water always take precedence over charts. There are two route alternatives between The Alligator River and Norfolk, VA. The “main” route, (Route 1) is called the Virginia Cut. The longer route (Route 2) is via the Great Dismal Swamp. From the Albemarle Sound, we prefer and recommend traveling north to Norfolk via Elizabeth City, NC (Route 2). We stay and stage for the Dismal Swamp transit at the free docks in Elizabeth City, NC. The Pasquotank River above Elizabeth City is the most beautiful part of the entire East Coast ICW, only approached by the Upper Waccamaw River in SC. The Virginia Cut generally carries the bulk of through pleasure craft traffic, and all of the go-fast boats that nonchalantly wake slower boats. The area of the North Landing River and the Currituck Sound is wide and shallow, with a narrow channel that must be honored. Go-fast boats will not slow when passing slower boats. The southern part of the route, below Coinjock, VA, is scenic. There are a couple of reasonable anchorages south of Coinjock. Although the route carries better depths (the control depth is 8′ – 9′), you must pay attention to the marked channels, particularly in the open water stretches. Markers are often well away from the deepest water of the actual channel. Do not get too close to the channel markers. This route has several bridges that most cruising boats will need to have open. All are restricted to either the hour or the half hour during daylight hours. The restrictions will affect slower boats more than faster boats. Faster boats often become impatient. Large, go-fast boats prefer this route, so just expect to be waked here; it’s just a fact-of-life on this route. Time the various bridge opening restrictions carefully. While waiting on bridges, station-keeping in current and wind, the occasional impatient boater and poor boating manners, can make this route unpleasant and challenging. Two of the bridges on this route are 5 miles apart. The southern one opens every half hour. The northern one only on the hour. If you can’t make at least 10 StM/Hr, it’s possible to have to wait 1-1/2 hrs for the second bridge. There are marinas in this section of the route, with all normal marina services. 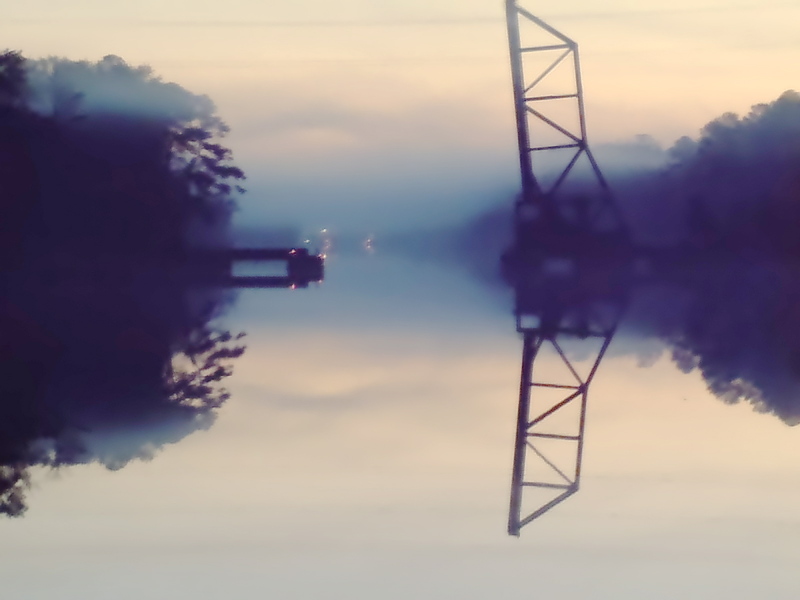 There is a single Corps of Engineers lock at Great Bridge (Chesapeake, VA). The lock operates in coordination with a 4-lane highway bascule bridge there. The bridge is restricted to hourly openings, which effectively restricts the lock. The lock has a free wall where boats can tie up and overnight. There are no services. There is a Farm Fresh super market two city blocks away, within walking distance. Beer and wine is available at grocery stores from Virginia south. The Dismal Swamp route northbound begins at Elizabeth City. There are two locks on this route, one at Deep Creek and one at South Mills. Northbound, plan to leave Elizabeth City before the bascule bridge’s opening restrictions begin in the morning. This will bring trawler-speed cruisers (7.5 its) to the South Mills Lock in time for the first locking of the morning. That timing allows cruisers to easily make the Deep Creek Lock opening at 13h30, and reach Norfolk by late afternoon. The Dismal Swamp canal is narrow. The canopy of trees lining the route does overhang the canal in some places, but is not a significant concern for sailboats. At normal pool datum, the canal carries depths of 6-1/2 ft. or better. There are (a very few) submerged logs in the canal bed. The two locks on this route are 22 miles apart. They operate (unless drought restrictions are in force) at 08h30, 11h00, 13h30 and 15h30. Cruisers locking through at either end (either direction) at the 08h30 locking will have 5 hours, until 13h30, to get to the other end. That works out to 22 miles/5 hours equals 4.4 StM/hr. Adjusted for locking and bridge transit time, actual travel speed (to avoid prolonged station-keeping at the destination end) will be at around 5 StM/hr. The speed limit on the canal is 6 StM/hr. Most trawlers and sailboats are at reduced speed at 5 StM/hr, so these locks are *not* a problem for passage in one day. Travel at 5 StM/hr speed will *not* generally lift submerged logs off the bottom, but we suggest boats travel 1/2 mile behind any other vessel they may be following. Especially, stay behind two-engine boats, where prop wash might lift debris from the bottom. With distance, anything that does lift off the bottom will settle back before you get to it. 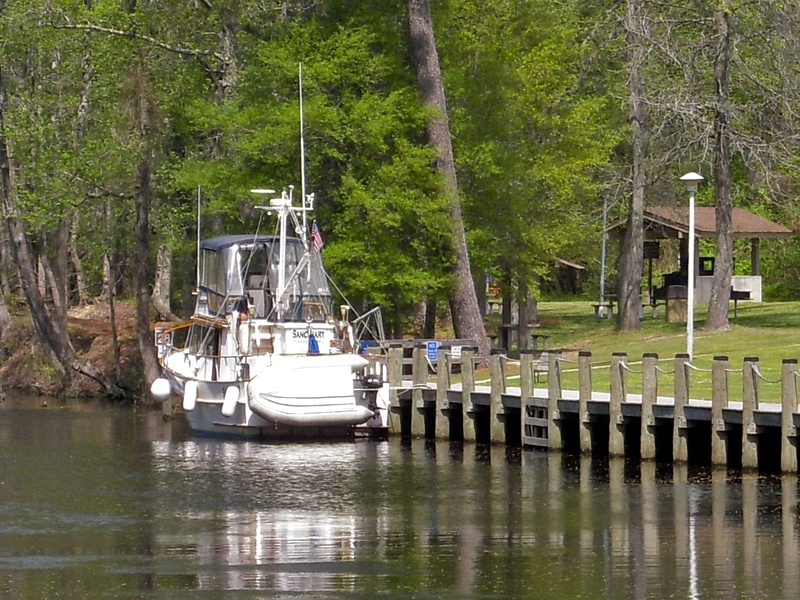 Within the canal, there are several overnight docks that are free. There are no services in the canal. The North Carolina Welcome Center is always a fun place to stay. Rafting is the rule, and is expected there, and at other docks in the canal. If you stay at docks within the canal over night, it’s easy to make the 11h30 locking at either end, from either end. Both locks have bridges that open only concurrently with the lockings. If you arrive at a lock early, you have no practical options to tie up, and usually must station keep. The greatest bonus of this route is the free wharf/slips at Elizabeth City, NC. 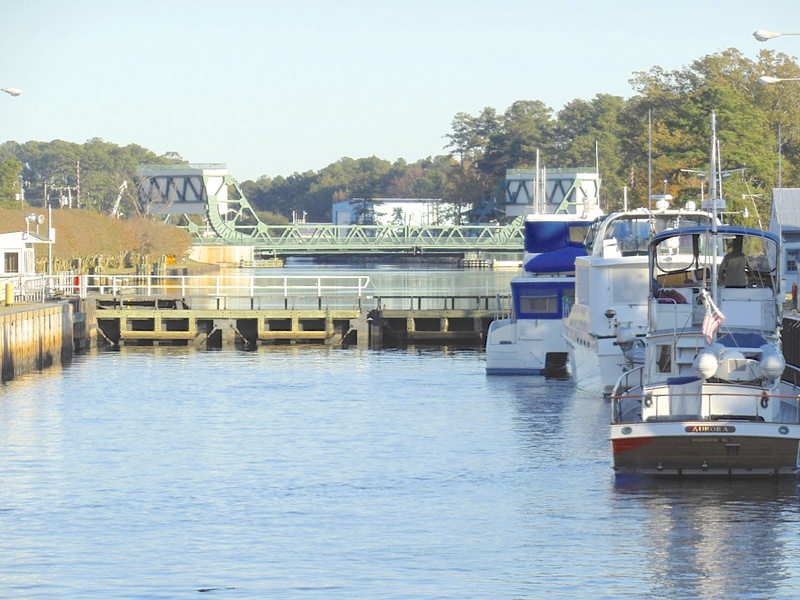 EC is the most welcoming city on the East Coast for boaters! There is a good Maritime Museum there, many restaurants (not 5-star, but good) and Sammy’s Barber Shop. Sammy has a sort of “cultural museum” in his shop. 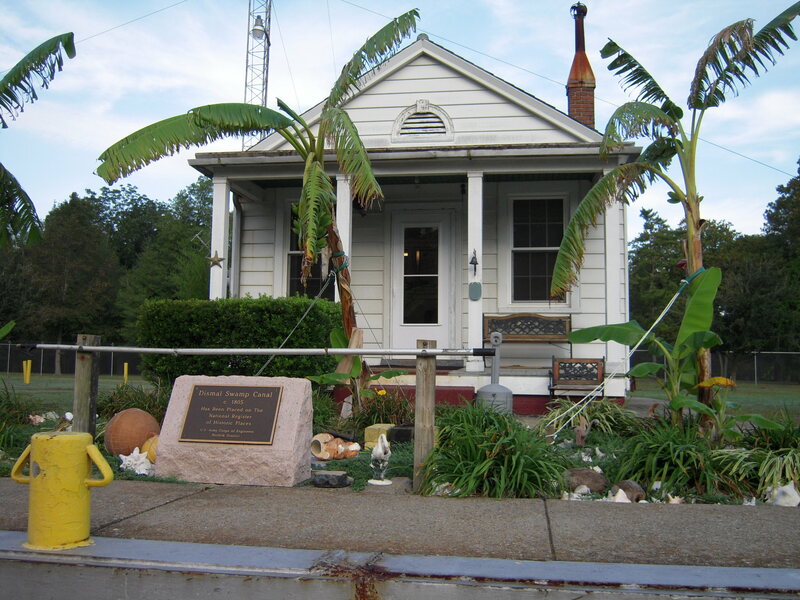 If you’re interested in State Police history, or “racially-incorrect” curiosities and mementos from the 50s south, a visit to his shop is a definitely a “must.” Plus, he’s a good barber. And of course, the Rose Buddies’ Wine and Cheese gatherings! NOW BE ADVISED, there is one bottleneck on the Elizabeth River through Norfolk/Portsmouth, at mile 5, that cruisers cannot avoid on either route. Immediately adjacent to the Gilmerton Highway Bridge is Norfolk & Southern RR Bridge #7. These bridges can be a very unpleasant surprise for the unsuspecting cruiser. Both bridges are very busy. The railway bridge is supposed to be open except when a train is coming. The highway bridge can not open if the railroad bridge is down. The re-constructed Gilmerton Highway bridge now carries an air clearance of 35′. The Gilmerton highway bridge is restricted for ***three*** hours, from 15h30 to 18h30. It will not open for pleasure craft during those hours, although it will allow pleasure craft to pass if it has to open for commercial traffic. Boaters cannot depend on commercial traffic, although there is a lot of it on that stretch of the river. There is tidal current in the Elizabeth River there, and the area is exposed if winds are up. All in all, this area can be the worst of all worlds. So, northbound, a cruiser that comes through the Deep Creek Lock at 15h30 cannot make the Gilmerton Bridge before the long afternoon restrictions. SOUTHBOUND IN THE FALL, AFTER THE CHANGE FROM DAYLIGHT SAVINGS TIME TO EASTERN STANDARD TIME, it will be ***dark*** by the time the afternoon restriction is lifted. BE AWARE AND PLAN ACCORDINGLY. 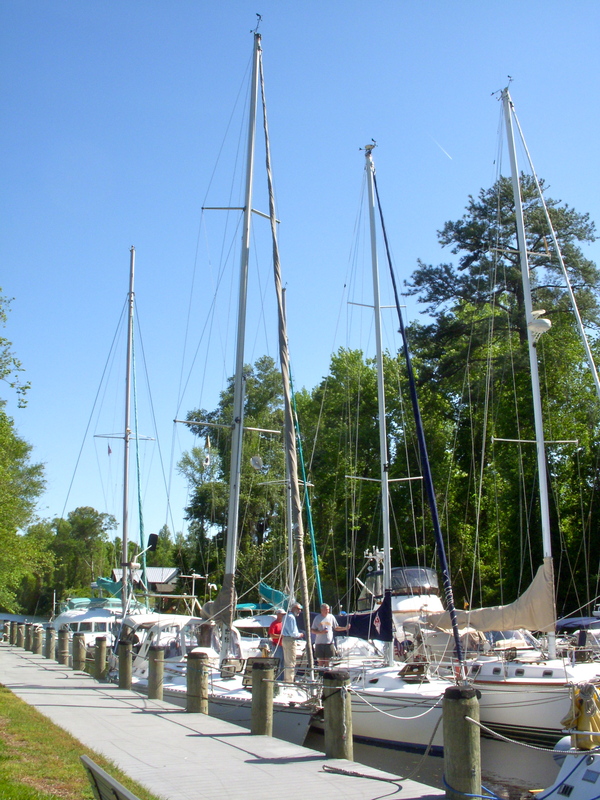 Because through traffic on the Dismal Swamp canal is constrained to daylight hours by the lock operation, you can legally anchor in the channel by the locks. That works fine above Deep Creek. Spend the night on the hook there, and lock through southbound at the 08h30 locking in the morning. The bottom above Deep Creek is sand and mud, and is not foul. Some people anchor south of South Mills in the feeder ditch there. If you do, I recommend using a trip line, although I have no specific knowledge of any foul. 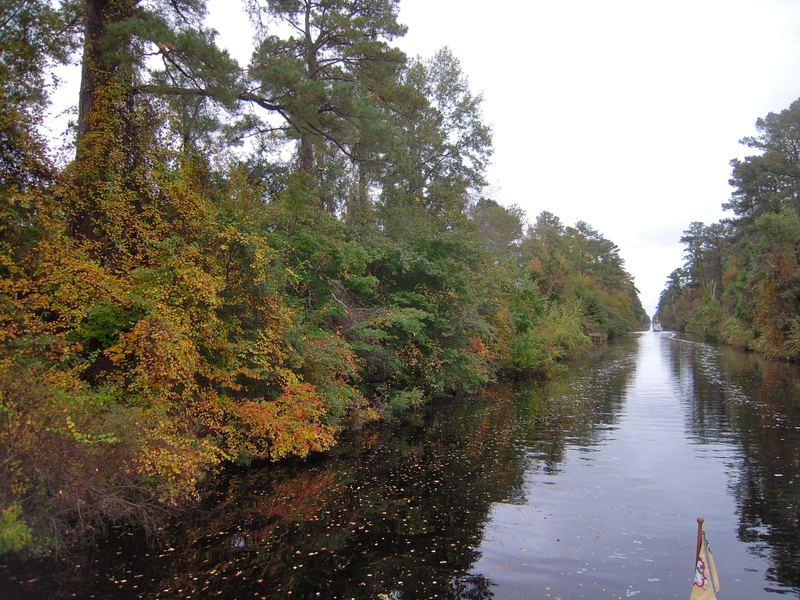 If severe weather – n’oreaster w/gale-to-storm force winds – is in the forecast, the Dismal Swamp Canal offers better protection and cover than the Virginia Cut. That said, the Dismal Swamp route is narrow enough that if a tree(s) does come down, it could block the canal. In that event cruisers would have to wait a day or so for the USACE to clear the canal. Generally, that would be worth it to me. This entry was posted in Albemarle To Norfolk on 2013/01/11 by gilwellbear.